The newest and latest feature to arrive in SQLEditor 2.7 [55MB Zip] is a customizable object palette. There were three fixed objects, that could be dragged from the palette into the document. The images have changed, but the basic functionality is little changed from v1.0, which also had a three object palette that worked like this. It doesn’t look that much different at first, however it’s much more than it used to be. The biggest change is that you can now add your own items to the palette. To add an object, you can hold option (alt) and drag it to the palette. SQLEditor create a new palette item, with a small preview of the objects. You can rename the item by double clicking on the label. Or delete it by right clicking and choosing delete. You can also add palette items from the clipboard. Add items to the clipboard using the normal cut or copy commands, then click on the small gear icon in the bottom left to see a menu. 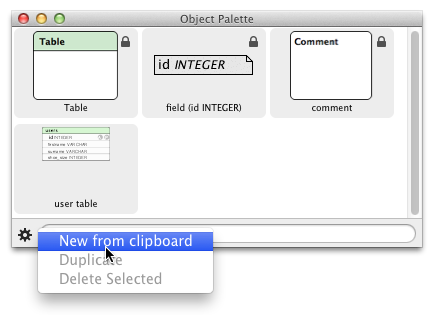 The New from clipboard command adds the contents of the clipboard as a new palette item. You can the use the new palette item just like the default ones. The palette item contains a copy of the original objects, so you don’t need the original document they came from. There are lots of possible uses for this, the obvious one is templates for tables. If you frequently create the same kinds of databases, you’re probably also creating the same kinds of tables. For example, there always seems to be a “user” table, with a fairly similar set of columns. In the above example the user table has been added and now we can instantly create a user table in a single action that contains the four important columns in every user table: unique id, first name, surname and shoe size. 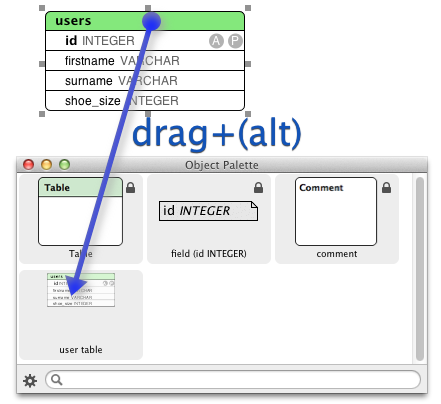 You can also set things like table type=INNODB, or set colors and styles (although not yet object labels). SQLEditor will save the objects and bring it out ready for use. You can also add groups of objects, including any relationships between them. This feature has been on the wish-list for some time, I’m glad it’s now finished and I hope that people will like it. This entry was posted in Macintosh, SQLEditor. Bookmark the permalink.